In the early 1800s the voyage from Europe to Australia took between four and five months. By the 1850s sleek, faster clipper ships had been designed. Captains of the clippers regularly competed with each other to make the quickest trip. The captain of the Marco Polo, which made the journey from Liverpool to Melbourne in a record 74 days in 1852, was said to use the slogan ‘Hell or Melbourne’. On 25 August 1859 the clipper ship Royal Charter left Melbourne for Liverpool, carrying some 480 passengers and crew. 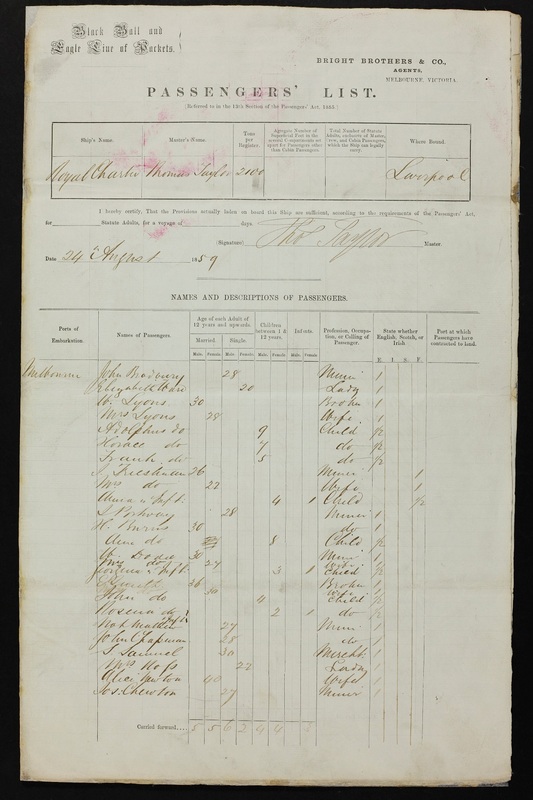 Amongst the passengers were many miners returning from the Victorian goldfields. Also on board was more than 79,000 oz (almost 2,500 kg) of gold, valued at over £320,000. More gold was carried by the passengers in their luggage or sewn into their clothes. On 26 October the Royal Charter sailed into a terrible storm, just off the north-east coast of Wales. The captain tried to anchor in nearby Moelfre Bay, but the ship was driven onto rocks only 50 yards (46 m) from the shore. It broke up almost immediately, leaving crew and passengers to take their chances in the raging sea. Some who plunged into the water sank, weighed down by the gold in their pockets. Women were hugely hampered by their voluminous skirts. Maltese sailor Joseph Rodgers bravely tied a rope to his waist and jumped into the sea to create a pulley system from the ship to the rocks, but of all the people on board, only 39 men survived. One lucky survivor was James Dean, a labourer from Wigan, who had converted his gold to an English cheque, carried in a waterproof belt. The passengers who survived the sinking of the Royal Charter each took a section of the rope used to save them as a keepsake. This piece of rope was donated by the family of survivor Tosh Dembreems, and is on display at the Merseyside Maritime Museum, UK. 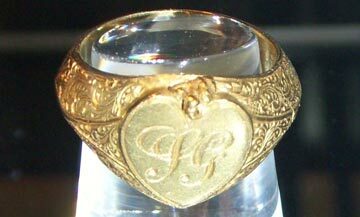 This gold signet ring from the wreck of the Royal Charter is on permanent display in the Emigrants to a New World gallery, Merseyside Maritime Museum, UK. 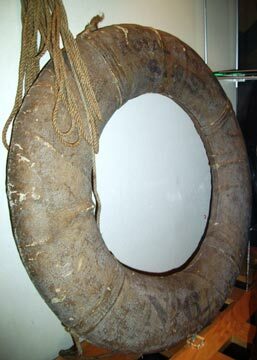 This lifebelt and lifeline from the wreck of the Royal Charter are on permanent display in the Emigrants to a New World gallery, Merseyside Maritime Museum, UK.